Manygolf is similar to Desert Golfing, in that it presents a random two-dimensional course and simple controls to angle and power shots. But it's also multiplayer, which means there's always someone annoying you by proving an "impossible" shot is anything but. There's no nonsense: as soon as the page loads you're assigned a name and thrown into the slowclap-worthy action. The creator, Thomas Boyt, has an official Twitter account for the game at @manygolf; he's published the source code and his dev notes. 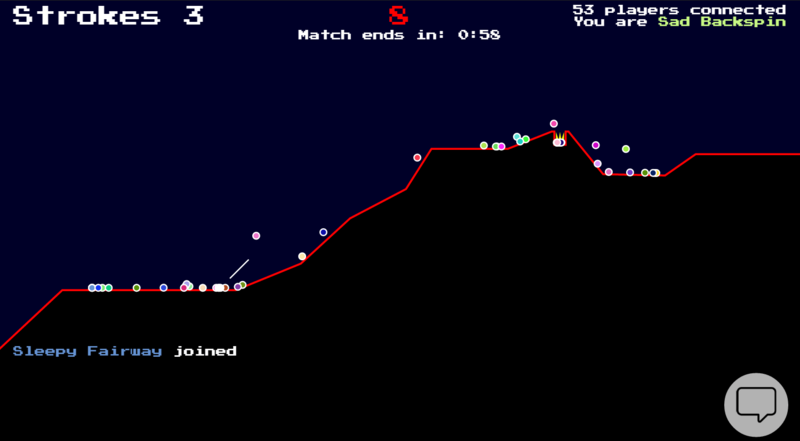 manygolf is a massively multiplayer golf game. everyone plays together, simultaneously, in the same session. Whoever wins the round in the fewest number of strokes wins. in the event of a tie, the player who scores the fastest wins.